While I was walking about during the Doors Open event I passed this couple having a good time in the front garden of a home near the U of Toronto. 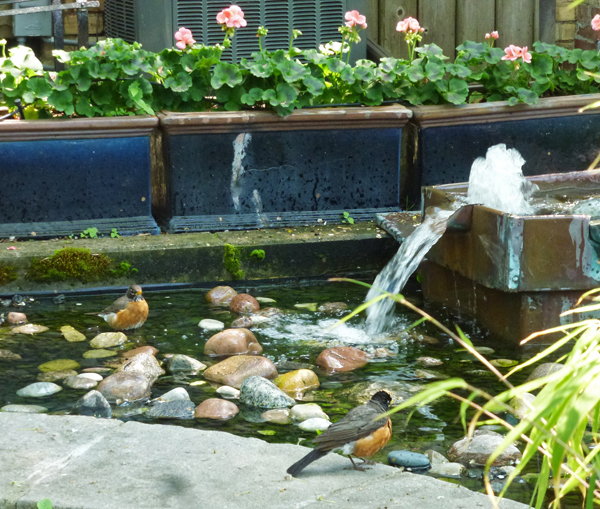 It was a really hot day and these robins were taking full advantage of this pond to cool themselves. I'll be back inside the buildings at the university tomorrow. Smart feathered friends and neat photos! We see few of these lovely robins and I don't know why! But what an ideal place for them to bathe and play! I've seen your photos of robins and in the past I've felt a little jealous that we don't see robins here in the hot valley. Then just the other day, there was a big fat robin just like the ones in this photo sitting on a branch of a tree right here where I live. In all these years, I've never seen a robin here in AZ. Now there is one living somewhere around here. I used to see them all the time when I was growing up and I missed seeing them. These two are really enjoying themselves. Hello, the Robins found a neat spot for a drink or bath! I like the flowers and fountain. Thank you for linking up and sharing your post. Happy Saturday, enjoy your weekend. Ha ha do you think Mrs Robin said to Mr Robin, let's pop by whilst the doors are open and have a bath?! What a delightful scene and capture, Pat! They certainly know to take advantage of the water! It is a perfect spot for them, and a pleasant scene to witness, too. Wonderful! I would love to have a water feature on our property! a beautiful garden bath. robins are frequent visitors to my bird bath and they go all in!! This is a sweet photo! Heaven on earth for them!